Budgeting and personal finance are all the rage. So what does a one income family budget for a relatively high paying engineering professional looks like for a family of 4? 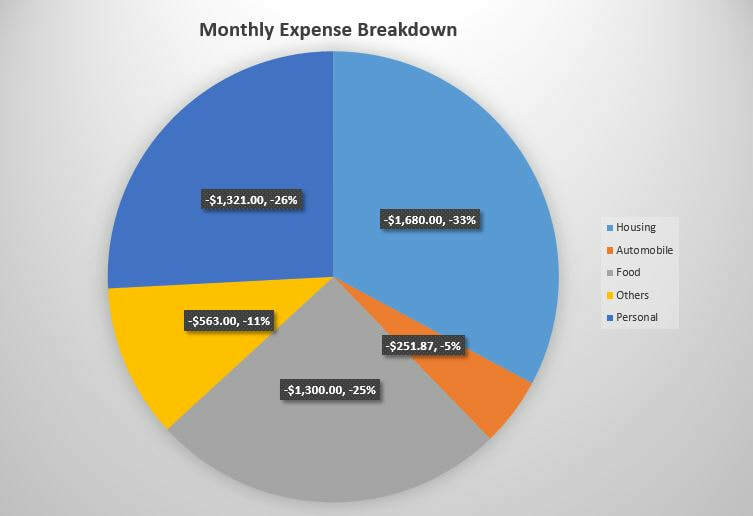 Reference the monthly expense breakdown chart above, housing is my biggest expense at 33% of total monthly expenses but only 18% of my total monthly after tax income. The second biggest expense is related to helping my family and extended families followed by the food category. A detailed breakdown is provided in the spreadsheet below. My lucrative career with a leading technology company is my main income. I'm very fortunate to have an engineering career that spans over two decades. My monthly after tax income is approximately $8,000. This is after contributing 15% of my salary to 401K retirement and setting aside $153.86 per month for HSA (Health Savings Account) to cover my daughter's braces and any potential copay doctor visits. Additionally, I derived at least $1000 (conservative number) by selling option premium contracts. I live in a two bedroom apartment in Central Florida that is approximately 1200 square feet with my wife and daughter. It is a small but cozy apartment in a beautiful area that is within walking distance to a shopping mall and a short drive to my workplace. Small is relative in this context since we moved and sold our 2800 square feet home a few years ago. We've a beautiful newly constructed house in a desirable zip code in another state that we're renting to generate monthly income, paying down the mortgage, and long-term appreciation. We decided to rent our home when we relocated to Central Florida for my new job. We've a single reliable Toyota car that we bought in 2009 that is completely paid off. I've a short commute to work (less than 15 minutes). We also live around the corner from the high school that my daughter is attending where she usually walk with her mother. It can be cumbersome at times to coordinate activities among the three of us. This is the main reason I chose to live close to a good school, shopping, and walking trails. Nevertheless, we always have a single car and have been managing just fine. I estimated that we spend between $600-$700 per month on groceries. We spend an equal amount on dinning out and entertainment, mostly on the weekends. During the weekdays, my wife cooks and always make extra that I can take to work. My daughter usually pack sandwiches and snacks for lunch but do buy school hot lunches as well. These are my cell phone, internet, gym and other miscellaneous expenses. 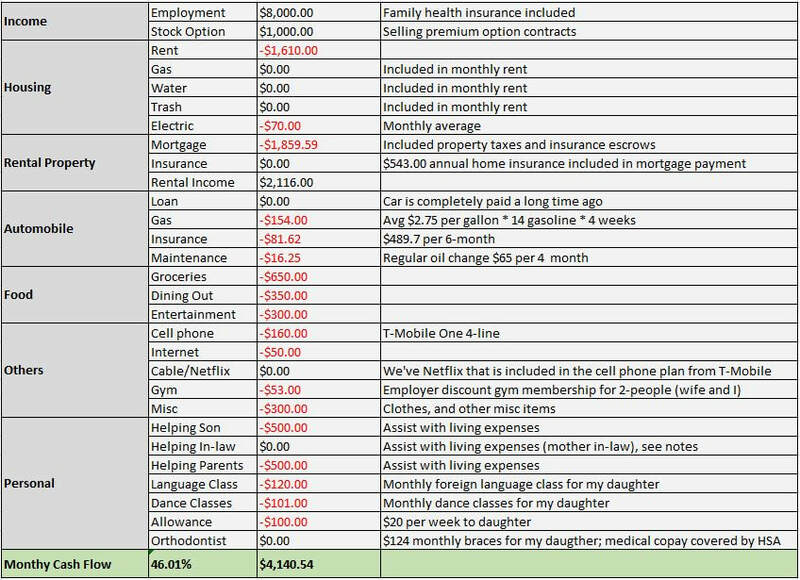 The bulk of my personal expenses are to help my family and extended families. My step-son is a struggling photographer living in New Year city. He is 23 years old and still covered under my health insurance plan. My blue-collar parents are retired where my siblings and I are assisting with their living expenses and travel. Up until recently, I was helping my mother in-law with her living expenses but she is now qualified for retirement benefits and can cover her own expenses. The food category is where we can adjust from month to month, if needed, while all other categories are relatively fixed. Over the next year or so, I hope to reduce or completely remove my step-son's living assistance. My parents will start to draw their retirement funds in the near future which means I can reduce their assistance as well. I don't have a hard set budget but as you can see I'm always mindful of how we spend our money. ​We can definitely afford a lot more but life is about choices and being content with what you have and your outlook on life, not how you're measured against your friends, neighbors, or co-workers. I came from a humble and underprivileged family background where the value of money came naturally to me at an early age. I'm mindful of getting older with shrinking opportunities, thus I'm very focused on savings throughout my career and have built a comfortable net worth. My wife, on the other hand, is focused on enjoying life. Together, we complement each other, and we're very fortunate to be able to take a median approach to saving and investing for retirement and to enjoy life as we go along. You'll find my recent pay stub, apartment monthly bills, electrical, mortgage and rental income below.